Commonplace books were popular in the 18th century, but go back to the Renaissance. You read something; you want to keep it in mind; instead of memorizing it you write it down so you don’t have to remember it. This is something Jefferson used to keep track of his speeches; this is something that a number of writers and readers during the 18th century used also to communicate. You write down something, you write a comment, you take it to a friend’s house and they copy down things they think are interesting, and they write a response in your book. It’s kind of like Facebook groups in 18th-century form. In class, I wanted students to get a sense of what this type of text world was like. 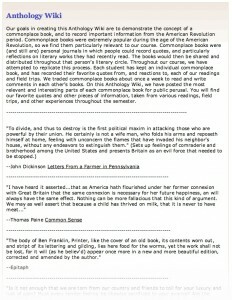 So they kept commonplace books throughout the semester. The students kept notes of their reading; they would write responses to it, they would add in different things from our trips. Some of them would cut out pieces of brochures and glue them in, some would write long reflections, and then they would write responses to each other. 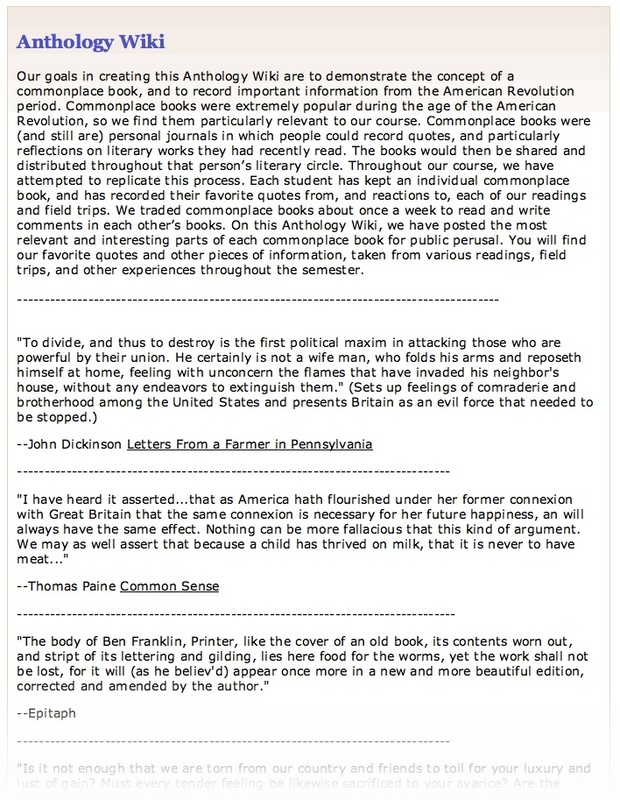 Toward the end of the course, I wanted them to think about the other dynamic of commonplace books which is that a lot of times when say Jefferson was putting a speech together or when someone like Elizabeth Graeme Ferguson wanted to publish in a magazine, you’d have to take something out of this manuscript world and get it into another medium. So the students constructed a course anthology, and it was up to them to decide the medium, and they wanted to use a wiki. They thought this was the best way to publish a commonplace book that still looked like what an 18th century commonplace book might look like, just no longer in manuscript form. So students entered excerpts from their books. These are quotations, reflections, and responses to each other. Someone added a link to a museum we went to as a way of adding a memento rather than scrapbooking it in. The benefits of using the wiki were that it was simple to set up, but it also opened up interesting discussions about changes between media, changes between anthologizing practices and got us into questions about what it means to work in a system where you don’t keep track of intellectual property. Nothing is attributed in the anthology, and the students wanted it this way. Commonplace books were about collective authorship so this was our chance to use some of the newest technology to construct one of the oldest types of media they’ve been involved in.